US, 1944, 66 minutes, Black and white. George Sanders, Virginia Bruce, Gene Lockhart, Alan Napier, Robert Armstrong, Marcel Dalio. The Arabia in the title of this film extends to the whole Arab world, as is mentioned, from Iraq to the countries of northern Africa. The action itself takes place in Damascus and its surroundings. The film is interesting in the context of World War II and American cinema contribution to morale-boosting. George Sanders portrays a journalist who has worked in the different spheres of action in the war and comes to Damascus. He immediately finds suspicious circumstances, Nazis infiltrating and gathering the Arab tribes together to work on the side of the Axis. His travelling companion is soon murdered, he encounters an attractive woman who says she belongs to the Free French Movement – but he is suspicious. He also encounters a local informant, played by Gene Lockhart. Alan Napier appears as the owner of the very modern hotel but he is suspected of being a Nazi spy. Damascus is presented in Hollywood style, markets and streets, plush hotels, foreign consulates as well as extraordinary lavish palaces of Arab leaders. The film was produced by Maurice Geraghty, producer of the Falcon series and, in fact, the screenplay plays like a Falcon film with George Sanders reprising his role, on a seeming holiday, discovering clues that lead him into a mystery, murders, espionage, dangers for himself and, ultimately, saving the day. Audiences since the 1960s are familiar with the Arab world from World War I to World War II through seeing Lawrence of Arabia. 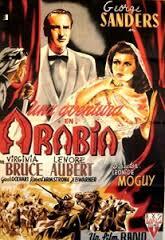 At this time Arabia was rather exotic, the fantasy worlds of small-budget action adventures. However, it was of interest in the war years, especially with the possibilities of the Arab tribes and their loyalties, the possibilities of sabotage if they sided with the Nazis, support if they sided with the Allies. It is also interesting to see the presentation of the Free French. Sanders is his usual suave self, though he does get injured a bit more than usual. He is also flirtatious, with Virginia Bruce, an ambiguous presence, but was part of the Free French. Gene Lockhart enjoys himself in his ambiguous role as the informer. Films like this continue to be interesting given the conflicts and wars in the Arab world since the war years.